Our team here at LMG is proud of the work accomplished for The Grand project. The Grand consists of 21 stories with over 200 apartments with luxury amenities and retail space. 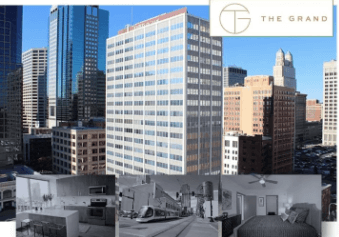 LMG was selected as the design-assist plumbing subcontractor under General Contractor Titan to provide a complete plumbing package for the 21-story tower in Kansas City, Missouri. FSC published a news release about The Grand project, with some details about the history of the iconic building. Construction for the original Traders on Grand building was completed in 1963. At that time, the building was intended for commercial use, and was home to the Traders National Bank for a number of years. After the completion of a $67 million renovation and a name change, The Grand is now an elegant 330,000 SF residential tower. Visit FSC to read the entire release.